Standard Contour shelving units are perfect for storing large items, or a large quantity of smaller items. The top shelf is 16"D, middle and bottom shelves are 18"D. Side panels are perforated on 1" centers to allow for middle and lower 18" shelves to be positioned to meet your requirements. Additional 18"D shelves can be added to these 44" high units. 18-gauge shelves are perforated on 2" centers to accept dividers and have a 3" reinforced lip to prevent items from falling off. Drop-down doors with locking, folding T-handles keep contents secure. Open bases fit neatly over wheelwells, while contour back allows unit to fit flush to van side. Standard Contour shelving units are perfect for storing large items, or a large quantity of smaller items. The top shelf is 16"D, middle and bottom shelves are 18"D. Side panels are perforated on 1" centers to allow for middle and lower 18" shelves to be positioned to meet your requirements. Additional 18"D shelves can be added to these 44" high units. 18-gauge shelves are perforated on 2" centers to accept dividers and have a 3" reinforced lip to prevent items from falling off. Drop-down doors with locking, folding T-handles keep contents secure. Open bases fit neatly over wheelwells, while contour back allows unit to fit flush to van side. Add a Divider or a Shelf Liner Kit to complete your unit. Units have a durable gray powder coat finish. 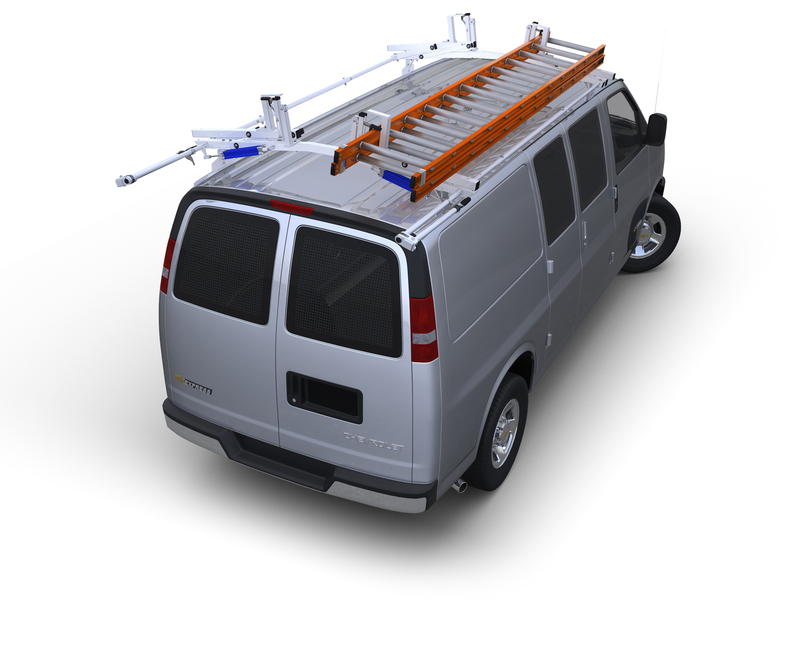 All units come completely assembled and fit full-size vans.